BATON ROUGE, LA – Texas Southern’s Marquis Curry and Robert Pearson played a huge role in the Tigers getting off to a great start in conference play. Texas Southern took the first two games against Southern in their first SWAC games of the season, but dropped the third. Both games were tough for the Tigers. TSU jumped out to an early lead in game one of the three game series. Texas Southern led 4-0 after six innings. TSU picked up two runs in the first inning when Tyler Flanagan doubled down the left field line for the Tigers’ first run, then Manny Cabral hit an RBI sacrifice fly to center field. 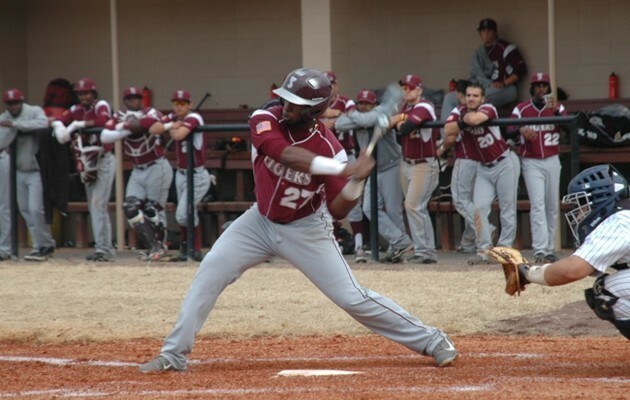 De’Mario Thibodeaux gave TSU their third run on a single in the second inning. The forth run came in the fifth inning on an RBI double by Ellis Stephney. The Tigers four run lead was shattered in the bottom of the seventh inning when Southern rallied for six runs and a 6-4 advantage. Texas Southern fought back and loaded the bases in the eighth inning. Curry came to the plate and hit a grand slam over the right field fence. TSU took a 9-6 lead. Southern scored one more run but Texas Southern held on for a 9-7 win. Curry had four RBIs while Cabral had two. Felix Gomez got the start and recorded four strikeouts, two walks and six hits with no earned runs in 6.1 innings. Carlos Rossell got the win and Michael Starkey picked up the save. Game two was just as exciting, but the battle came from the pitcher’s mound. Pearson kept Southern in-check in his first complete game of the season. He gave up four hits and one earned run after nine innings. Pearson recorded eight strikeouts. TSU scored first when Stephney doubled to left field and Jerry Ford, II scored. Southern tied the game 1-1 in the bottom of the first inning. The game remained tied until the top of the ninth inning where a sacrifice by Chris DeLeon allowed Curry to score the winning run.